Nike’s marketing pitch: Crazy comfort that lasts as long as you can run. Upper: Engineered mesh, synthetic overlays, full-length sleeve. Outsole: Thin and pliable rubber lugs under high wear areas. The Odyssey React is a very comfortable daily trainer, courtesy of the high-volume React foam midsole. The upper, while snug, has very smooth and plush interiors. The Nike Odyssey React is a cushioned neutral trainer with the pretense of a stability shoe. 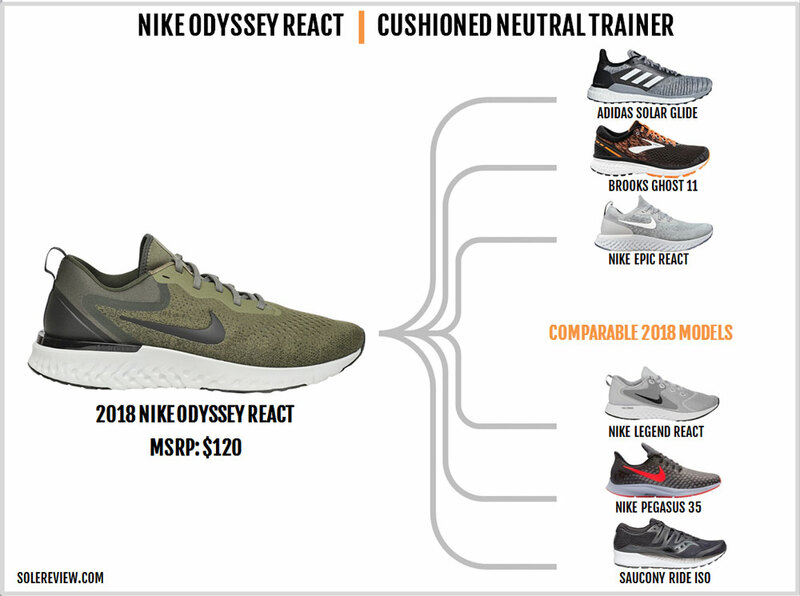 We say this because you’ll eventually notice that we have classified the Odyssey React as a neutral shoe in our list and the comparable shoes infographic. 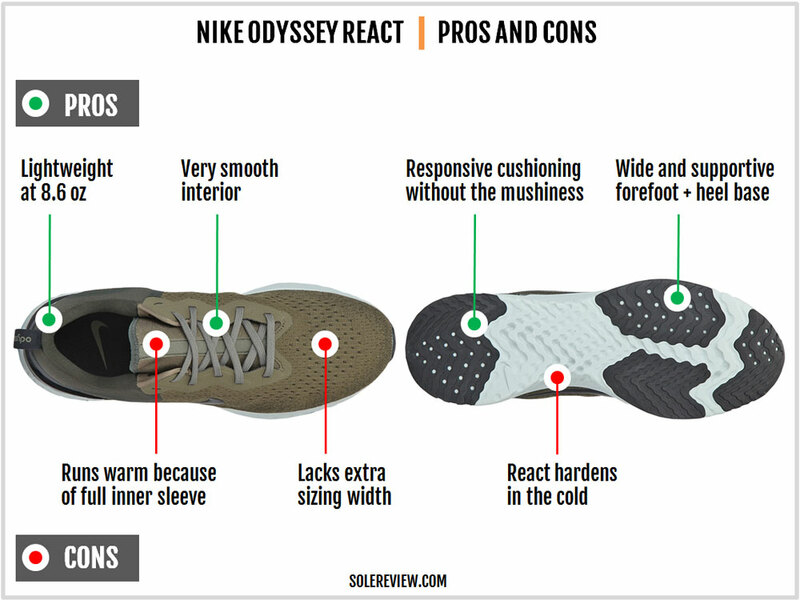 It is important to clarify this right at the beginning, because some might think of the Odyssey as a stability or support shoe. Like most things, there’s a good reason for it. 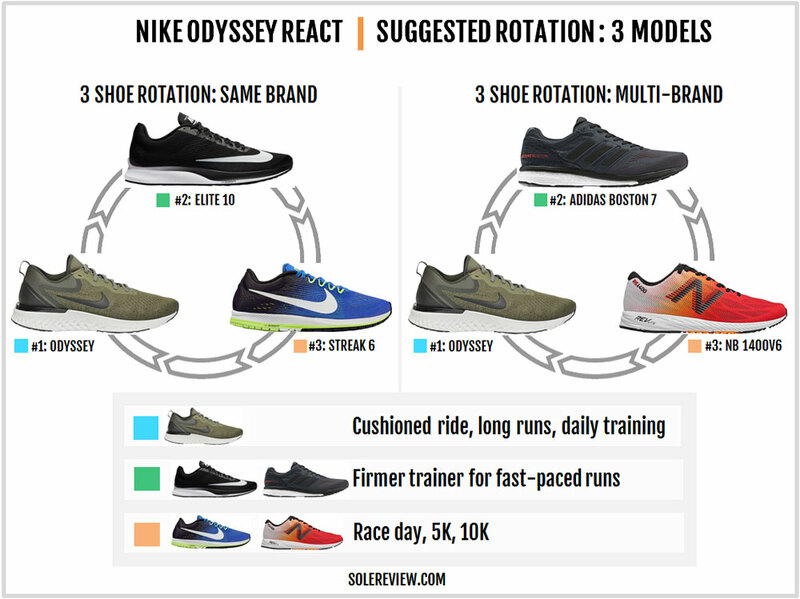 Nike has recycled the name Odyssey several times over the years. 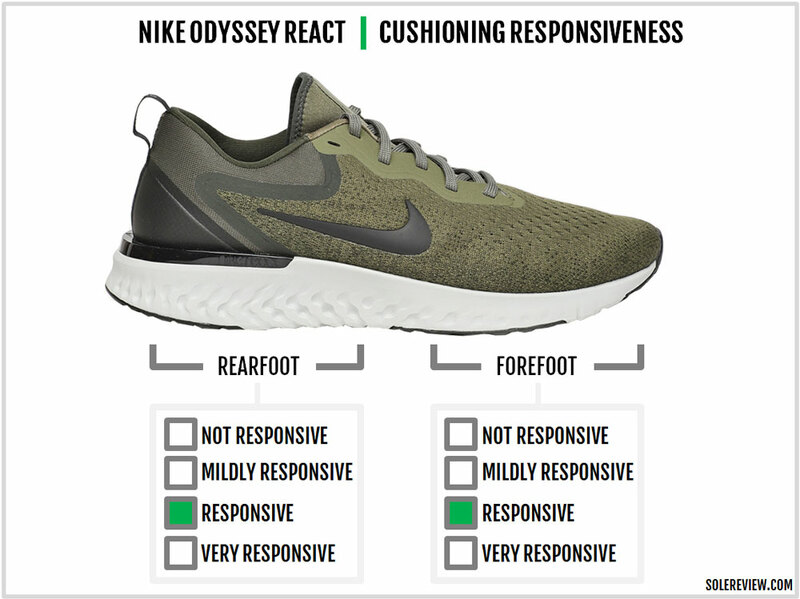 If we’re not wrong, the Odyssey React is the third use of that name. The last time Nike sold a shoe with the same name, it was a no-holds-barred stability shoe with a toe-to-heel medial post. 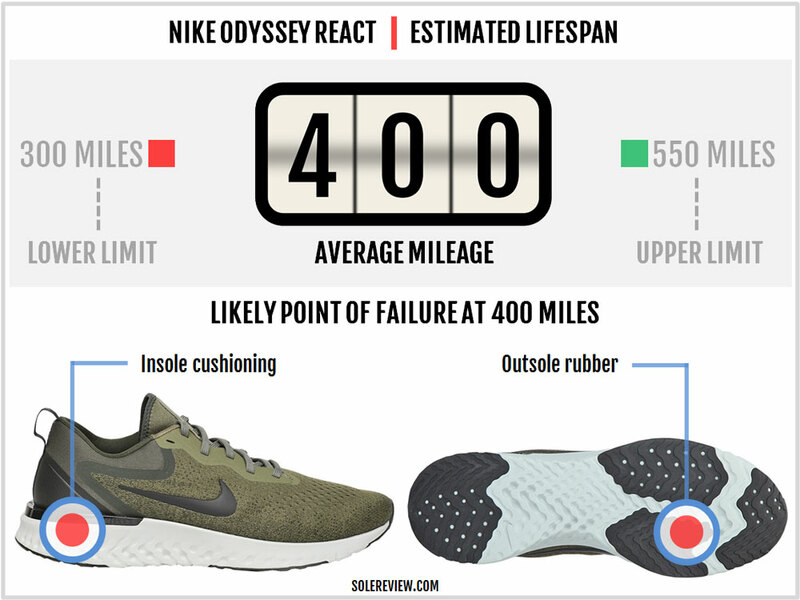 Given that background, it’s easy to see why some people might view the Odyssey React as a support shoe. Also, it doesn’t help that the plastic heel stabilizer has a tiny drop-down on the medial side. Nonetheless, the Odyssey is anything but a stability shoe. 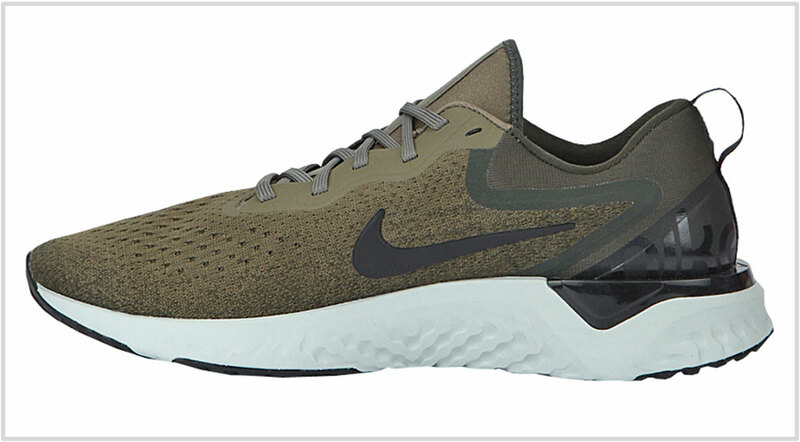 It’s as neutral as the more expensive Epic React Flyknit, except that there are a few differences between the two. 1. Upper fit: The Odyssey React has a narrower and non-stretchy upper. Due to the doubled-layered (sleeved) upper, the insides run warmer than the Epic. The heel fit is better, and the overall interior feels smoother than the Epic. 2. Ride quality: Very similar to the Epic due to the nearly identical foam midsole. There are additional rubber pieces under the forefoot, but these thin slabs are well integrated with the midsole. Also, the fabric below the insole is generously perforated (an obvious fix for the popping sound on the Epic). This also results in the upper midsole feeling softer than the Epic. 3. Price: The Odyssey is $30 cheaper based on the US retail price. So if you’re ok with the narrower upper, buying the Odyssey get you the Epic’s ride for much less. You can go further and get the Legend React instead of the Epic or the Odyssey. The Odyssey’s midsole uses the new Nike React foam in a full-length, high volume configuration. The overall aesthetic closely resembles the Epic except for two additional details. This design hints at the ‘stability’ aspect of the Odyssey, but it is nothing more than a footwear equivalent of a placebo. The extension has a negligible effect on the ride quality and the Odyssey is as neutral as the Epic. Like the Epic, the Odyssey has a high-volume midsole with a wide rear and forefoot. The inner midsole flares outwards under the heel, resulting in a wide base. The Odyssey has tons of deep cushioning, whether it’s the heel or the forefoot. The React is made of a synthetic rubber blend, so the softness is served without the energy-sapping mushiness. Nike has done an excellent job of integrating the forefoot outsole rubber with the React midsole. There are a couple of things we like about how Nike has done it. The rubber slabs are thin and pliable, which means they are closely matched with the midsole firmness. Three out of the four lugs are perforated with small holes. This allows the outsole and the midsole to perform cohesively without the slabs sticking out from a sensory perspective. Secondly, the outsole rubber is level with the rest of the midsole. The midfoot outsole is exposed React foam, and the rubber lugs are inset – thus making them flush with the surface. There are a few upsides to this arrangement. Like the Epic, you get an unadulterated cushioning experience without the (otherwise) noticeable hardness of the outsole. And the forefoot outsole gives the Odyssey a grip advantage over the Epic. The rest of the ride experience is very similar to the Epic. The single density of React translates into smooth and consistent cushioning throughout the shoes’ length. The heel edge is angled, and that works to ease landings for rearfoot strikers. And like we said before, the modified heel shelf of the Odyssey does nothing to affect its neutral ride character. The midsole sidewalls are designed in a way which prevents excessive midsole lean. Because of the wide heel and forefoot, the React is fairly supportive for its class. The plastic shelf helps keeps the foot centered too. The Odyssey React works best when used for longer races or daily training at an easy pace of 10 min/mile (6 min/km) or slower. The cushioning isn’t mushy and the React foam is responsive. But if you account for the midsole volume, the Odyssey isn’t the best choice for fast training or short races. We’re sure that React is going to gradually make its way into Nike’s road-racing category in a thinner and speedier form. Till then, refer to our rotational section of the review for suitable alternatives. There are two other things we need to call out about the Odyssey. We’ve received some reader feedback about how their Epic React(s) made a popping sound during runs. While we didn’t experience any in our pair, it was apparently due to the empty space between the fabric lasting and the React midsole. The Odyssey fixes that with a fully perforated strobel fabric below the removable insole. It is now punched with a lot of holes and this should address the popping sound. Also, this alteration also makes the ride slightly softer near the top as there’s less material between the React midsole and the foot. The other thing we’d like to underscore is the React’s ‘reaction’ to freezing temperatures. As typical of most rubber, the midsole hardens in extreme cold. So if you planning to run in the snow, just be aware that the Odyssey won’t feel the same as it does on a bright sunny day. For a detailed description of the change, read our Epic React write-up. 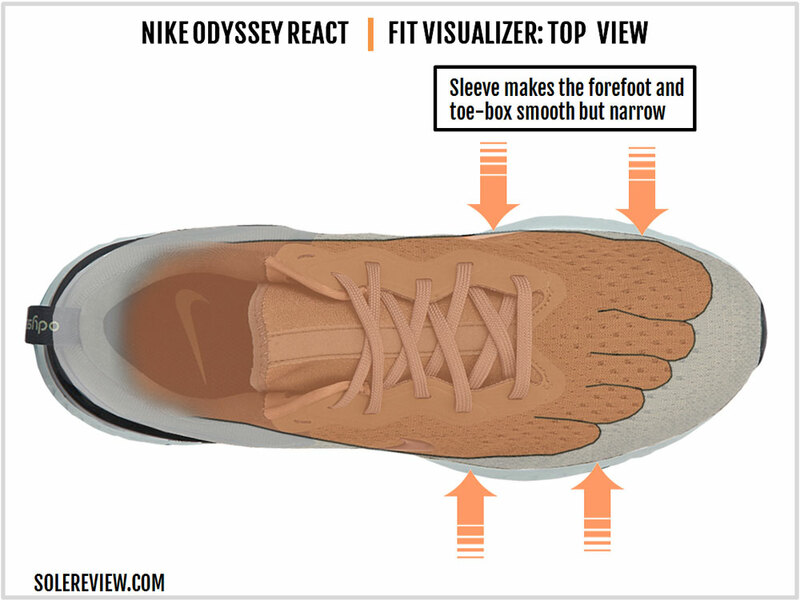 The Odyssey has a full internal sleeve which makes the forefoot fit narrow. The sleeve is a second layer of textile below the engineered mesh which extends all the way upto the toe-box. As a result, the interiors run slightly warm, snug, and shallow in the front. We recommend going true-to-size in the Odyssey, though. While the insides feel very smooth, the engineered mesh has no stretch. Since the Odyssey only sells in a single width, you’ll have to consider other options (see our last section for recommendations) if you find the fit too narrow for your liking. For a standard ‘D’ width, the fit is comfortable enough. The sleeve cocoons the foot nicely, and there’s neither tongue slide nor noticeable lacing top-down pressure. The tongue uses a Neoprene-like material with a soft lining and some amount of padding. The heel grip is excellent, something you’ll appreciate if you found the Epic React’s heel fit and feel to be less than ideal. 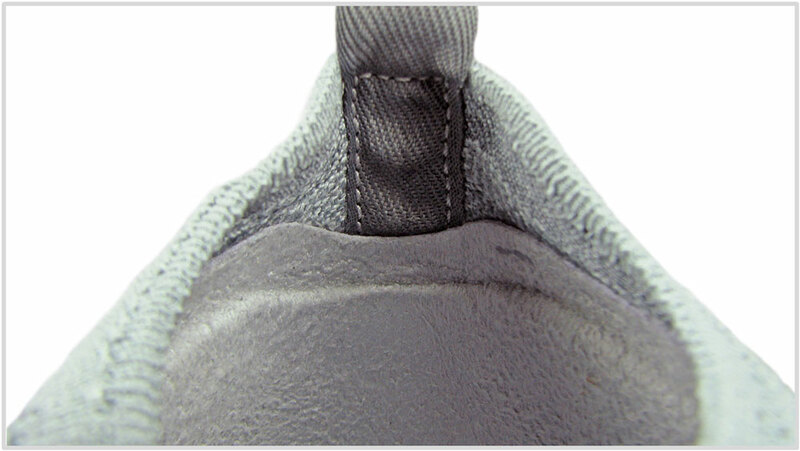 The collar lining is soft, padded, and the molding grips the heel perfectly. You can use the Odyssey without socks, something which wasn’t recommended in the Epic due to the intruding heel bump. The running experience is pleasant. There are no hot spots or rub areas, thanks to the complete absence of inner seam bumps. The same sleeve which makes the Odyssey snug also makes the interiors extremely comfortable. The upper requires no time to break in, so it’s good to go right out of the box. There’s only one thing you need to watch out for. During longer runs of over 10K, the Odyssey starts feeling warm inside. You won’t find much reflectivity on the Odyssey, so this isn’t a shoe for low-light conditions. It’s better to wait up for Nike’s high-reflectivity collection which usually releases each fall. The fully sleeved upper is super durable, so unless you’re wearing a size smaller there will be negligible damage over the life of the shoe. React is made of synthetic rubber so it’s long lasting. The new outsole also gets additional outsole rubber lugs which lie flush with the exposed foam areas, so wear and tear will happen gradually. And like in most running shoes, the insole will flatten sooner than the rest of the sole. The Odyssey should give you 400 running miles or more unless you’re running under extremely warm conditions. The Odyssey has a lot going for it. The React midsole delivers a deep, substantial kind of cushioning which isn’t found in regular EVA foam materials. The said cushioning is delivered without mushiness and this only increases the shoe’s versatility across workouts. Regardless of its stability shoe pretensions, the Odyssey’s neutral ride is inherently supportive due to the wide midsole design. There are a few shortcomings. The Odyssey doesn’t come in a wide, so the somewhat narrow upper fit is all that you get. 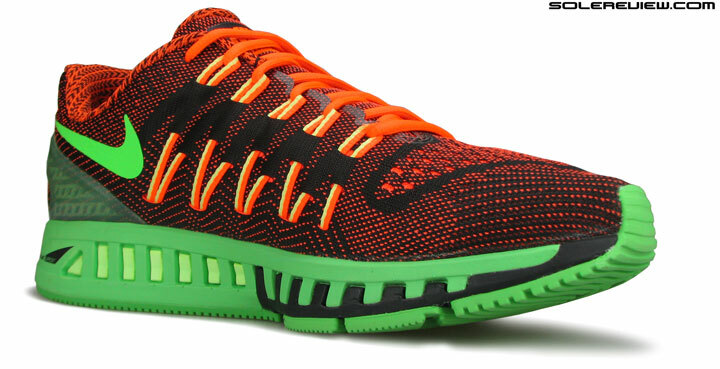 The upper is warm due to the twin-layered upper, so the shoe isn’t ideal for running in muggy weather. Lastly, the React foam hardens under freezing conditions, thus making the ride noticeably firmer. The Nike Epic React sells for a $30 upcharge over the Odyssey. So what extra does the money get you? Just a Flyknit upper, really. The ride quality is very similar, minus the forefoot outsole rubber and the small alteration on the heel clip. Buy the Epic only if you want more forefoot room or value the Flyknit construction. 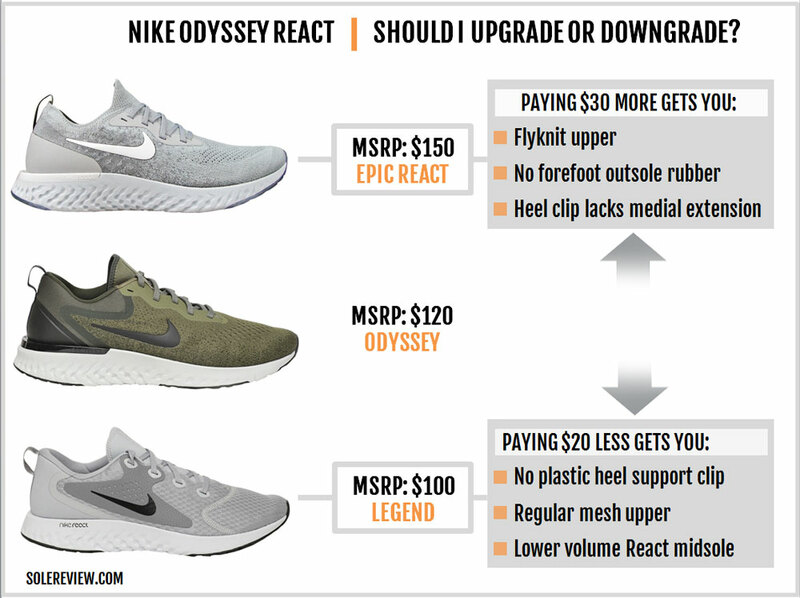 The alternative is the less expensive Legend React. It is a cushioned neutral trainer with a complete React foam experience. With the lesser price comes a different spec on the upper materials, a lower volume midsole, more outsole rubber coverage, and without the plastic heel shelf. Judging by the rapid introduction of new Nike models, there will likely be better rotational options in the future. But based on what’s sold currently, the Zoom Elite 10 and the Streak LT4 are ideal companions for the Odyssey. The Elite 10 uses the same sole as the 9, so you get the same efficient ride which is conducive for faster miles. For race-days, either the Zoom Streak 6 or the LT4 will do. The LT4 is a more minimal racer while the Streak 6 has a higher level of cushioning as compared to the LT4. One can also replace the Elite 10 with the adidas Boston 7 or the Asics Dynaflyte 2. If you rather prefer shoes with mild support features, take a look at the adidas Tempo 9 or the Asics DS Trainer. Likewise, your race-day options will either be the New Balance 1400V6 or the 1500V4. 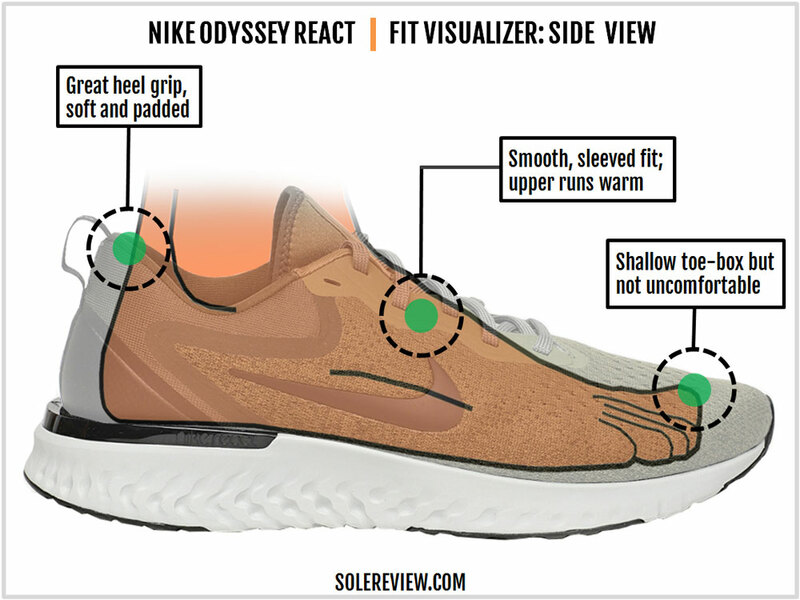 As mentioned at the beginning, we see the Nike Odyssey React as a neutral trainer rather than a support shoe. 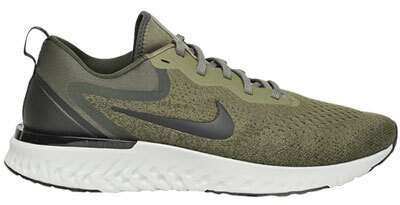 While there are plenty of neutral running shoes within this price band, it’s worth calling out a few Nike models first. 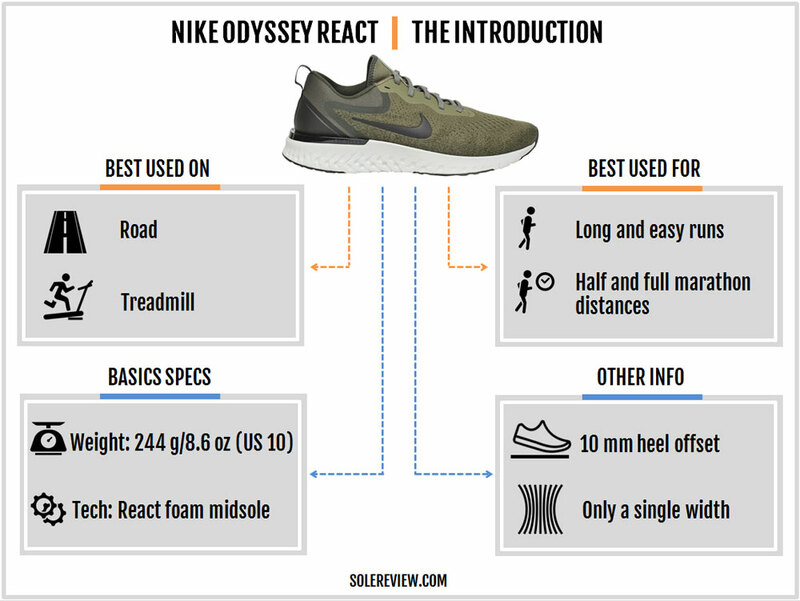 Except for the Flyknit upper and the more expensive price tag, the Epic React has a ride quality which is very similar to the Odyssey. And for $20 less, you get the Legend React, another shoe with the full-length React foam experience. Then there’s the Nike Pegasus 35, a cushioned and responsive shoe with a soft and smooth upper fit. The rest are the usual suspects – the Saucony Ride ISO, the Brooks Ghost 11, and the adidas Solar Glide. The Saucony Ride ISO has a medium-soft and supportive ride, and so does the new Ghost. In some ways, the Solar Glide is the adidas equivalent of a Nike React-based shoe. The midsole features a full-length Boost foam for deep cushioning; the German equivalent of the Odyssey. That being said, the $20 higher price puts the Glide out of the Odyssey’s price class.